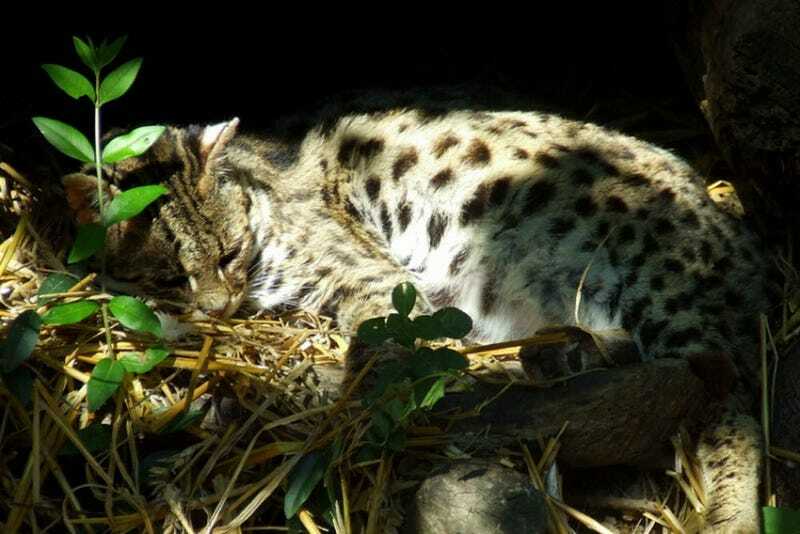 The Kodkod (Leopardus guigna) is a small wildcat with a small population distribution - it can only be found in central and southern Chile, and sometimes in the parts of Argentina that border that range. The Kodkod's effective population size is about 10,000, with a declining trend. It is also called guina by locals. Kodkods can grow up to 20 inches (51 cm) in body length. They have large paws and thick tails about 10 inches (25 cm) long. Kodkods weigh 5.5 pounds (2.5 Kg) at most. While most of these cats have a brownish coat color that is either yellow-brown or gray-brown, melanism is a common variation and it isn't unusual to see Kodkods with black and spotted coats. Kodkods are most commonly found in the temperate rainforests of the southern Andes - in particular, the Araucaria and Valdivian forests, which are distinct because of the presence of bamboo in the forests' understories. Kodkods range up to the treeline, which is an elevation of about 6,200 feet (1,900 meters). Kodkods are equally active during both the night-time and the day-time, but they only venture into open ground when they have the protection of darkness. They are very good climbers, and can easily climb large trees whose trunks are as wide as a meter in diameter. They feed on small animals like rodents, reptiles and birds. Female Kodkods will give birth to a litter of up to three kittens after a gestation period of 78 days. The Kodkod is most under threat from habitat destruction - the logging industry takes trees from its natural moist temperate forest, and often these are replaced by the spread of pine forest plantations and other types of agriculture. It's believed that no one subpopulation of Kodkods contains more than 1,000 individuals.